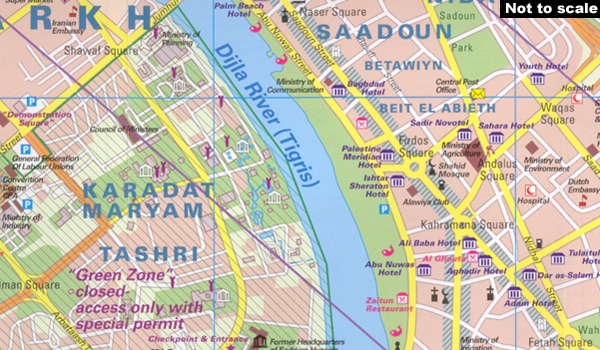 Detailed, indexed street plan of Baghdad, updated in 2007 to show security zones and restricted access areas, with an enlargement of the city centre, a map of the airport zone, and a road map of the wider environs of the city. The main map at 1:25,000 shows the central part of the city and the surrounding suburbs, including the Sadr City. Main streets have names, otherwise just the names of districts are shown. Boundaries of the special access Green Zone are clearly marked. A wide range of symbols, graphics and colours indicate various places of interest, including hotels, public buildings, monuments, religious establishments, etc. Main shopping streets and areas are highlighted. On the reverse, the central part of the city along the Tigris is shown in greater detail at 1:9,000. The plans have an index listing street, neighbourhoods, public buildings, embassies, hotels, shops, etc. The restricted Green Zone around the city’s international airport is shown at 1:25,000. A general map of the central part of Iraq at 1:850,000 extends north to Kirkuk and south to Karbala and Al-Hillah. Also included is a small ethno-religious map of the whole country.